1 of 1 Place 2/3 cup finely chopped spiced mixed nuts in a small bowl. In a microwave-safe bowl, combine 1 pkg (12 oz) semisweet chocolate chips and 2 tsp vegetable oil. Microwave at 50% power for 1 minute; stir. Continue microwaving at 50% power in 30-second intervals, stirring each time, until melted. 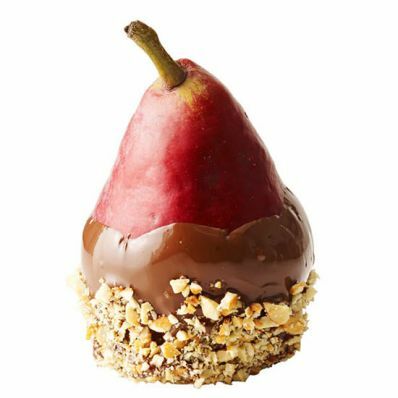 Holding on to the stem end of a red Anjou or red Bartlett pear, dip the bottom half into chocolate, allowing excess to drip back into bowl, then dip into nuts. Set on a parchment-lined baking sheet. Repeat with 3 more pears. Allow to dry completely at room temperature.